I am lately smitten with a new yarn. It’s Findley, one of the new Juniper Moon Farm yarns in silk / merino that I was able to snag a few early samples of (along with an advance copy of a Findley pattern!) thanks to all the volunteer work I’ve been putting in over there. On one of the many all – nighters waiting for lambs Caroline stayed with me and she was knitting one of the new patterns with Findley for the photo shoot for the upcoming book. I was instantly in love. Now that I am knitting it myself, I can tell you – it’s to die for. 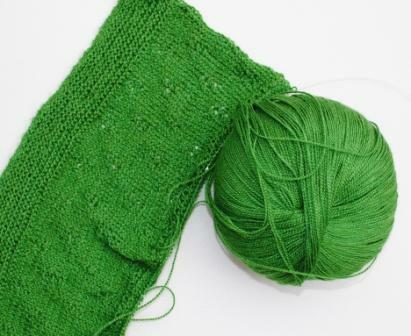 I am working on the Three Lace Cardigan in colorway “Crocodile”. B: I am addicted to it. I can’t put it done. It’s WAY fun to knit with. Every day when school’s done I pop my earphones in, open my This American Life app on my ipod (or the occasional Ricky Gervais podcast) , and knit until I can’t keep my eyes open. I don’t have any pictures of what the finished product will look like – you’ll have to wait until it’s complete. BUT – if you’ll be at the Maryland Sheep & Wool Fest this weekend, be sure to find us. There will be plenty of it to feel for yourself! That green is amazing! 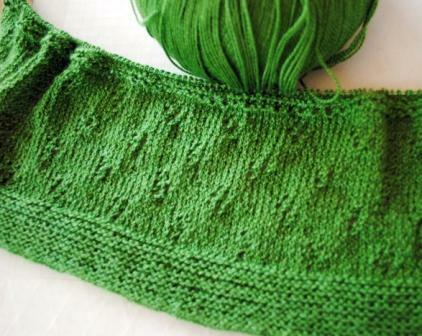 I’m hoping to have my shawl thing in Findley done by shearing. OOO – I saw those wooden piggies too! I am nagging DH to make me one!